Happy Friday, guys! With less than two weeks to go until Christmas, I figured a festive cocktail was in order. I’ve made margaritas with almost every fruit under the sun now, but this cranberry version has always stood out as one of my favorites. A cranberry syrup is made from fresh cranberries and sugar, then pushed through a fine mesh strainer to remove seeds and pulp. Then the usual suspects are added for margarita mixing…tequila, triple sec, and margarita mix. Which, if you’re not doing so already – save yourself several bucks and make your own! It’s so much better than the store-bought stuff. You (and your cocktails!) will thank me. I like to serve them with a sugar rim that’s had a bit of orange zest mixed into it, but a standard salt rim is also wonderful. 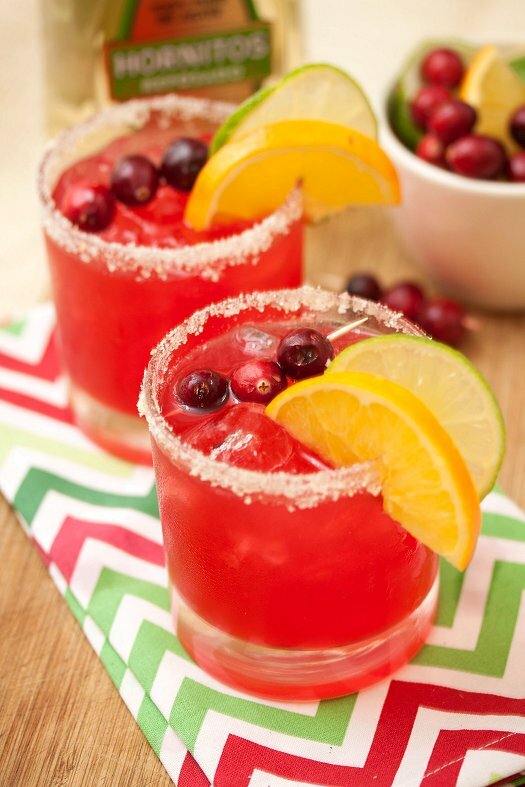 Garnished with a few cranberries and a wedge or two of citrus, it doesn’t get any more festive than this! Their gorgeous red hue lends perfectly to Christmas parties, especially since a large batch can be made up in advance and refrigerated until party time. I hope everyone has a great weekend! For the sugar rim, combine sugar and orange peel in a food processor. Pulse a few times to blend orange peel into sugar. Pour onto small plate and set aside. To make the cranberry syrup, combine cranberries, sugar, and water in a small saucepan. Bring to a boil over medium-high heat. Reduce heat to low and simmer for 10 minutes, until cranberries have burst. Pour through a fine mesh strainer into a large measuring cup or bowl, pushing on the pulp to remove as much liquid as possible. Let cool then place in an airtight container and refrigerate. Syrup can be kept refrigerated for up to 2 weeks. To make the margaritas, rim the edges of two glasses with a lime wedge and dip into the orange sugar. Fill glasses with ice. Combine cranberry syrup, tequila, triple sec, and margarita mixer in a carafe or large mixing glass and stir to combine. Pour into ice-filled glasses. Garnish with lime and oranges wedges, and additional cranberries if desired. Hi Laura…….we are having a party next weekend….how many drinks will this recipe make? Thanks, Merry Christmas! This makes about 3 drinks, but the recipe can easily be multiplied. Let’s hear it for Margaritaville for the holidays. What a clear and beautiful Xmas red. Very festively presented. The perfect cocktail for the holiday season!